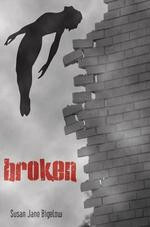 One of the things that caught both my publisher and I off-guard was that BROKEN started getting reviewed as a YA novel. I hadn’t written the book specifically for young adults, and I know we wondered (and are still wondering) just what it is about the book that makes some people class it as YA fiction. Part of the the reason might be the age of one of the protagonists: Michael Forward is 14. There is also a definite theme of growing up; Michael has to find a way to do the right thing despite facing his worst fears, and he doesn’t always succeed. Plus, BROKEN is relatively short, it clocks in at about 60,000 words (most non-YA SF/Fantasy seems to be longer, averaging around 100K, at least from what I’ve heard). Lastly, and perhaps most importantly, it’s exactly the kind of story I would have loved when I was 14. But does that make it YA? What does make something YA? I’m still not sure. I’ve found a couple of definitions here and there, but I haven’t found any of them satisfying. I think there are plenty of books which are easily identifiable as YA fiction, but there are plenty more that fall into this sort of gray area BROKEN is in. Is YA in some cases more about marketing than content (see: Urban Fantasy vs. Paranormal Romance for another very, very fine distinction that may just come down to which cover goes on the book)? Does the author’s intended audience matter? I have no objection to BROKEN being classed this way, for the record, but I do have to admit it wasn’t my thought when I was writing it. I’m still mulling all this over. What do you think, folks who have read the book? Could it/should it be classed as YA? Does the label we give a book matter, except as a tool to reach new audiences? 3 Responses to "What Makes a Book YA, Anyway?" Could it be classed as YA? I think so. If you read the Wiki article on YA, Broken certainly fits. Should it be? That one is a judgment call. Will labeling it hurt or help the book? Will labeling it limit it or open it up to a new audience? I don’t know the answer those questions. Some people might be genuinely turned off by a YA label and give it a pass. Personally, I view YA books as my secret, guilty pleasure. I love reading them if they are well done. Think Cory Doctorow’s Little Brother for an example of well done YA. If the story is engaging, it really shouldn’t matter what the label is. I read a lot of YA myself, just because there’s so much excellent storytelling going on there, about serious and relevant topics. Sarah Darer Littman is a great example. I’ve seen a LOT of adults reading YA, and particularly YA dystopia, which happens to be HUGE right now. So I’m perfectly happy to send Broken around to the YA blogs to review, capitalizing on that…while I don’t think of it as a YA novel myself, if that’s what gets it in front of more readers, I’ll do it!